Tyler Candle Company first started selling Tyler Laundry Detergent in 2006 and the since then, some customers will never wash their clothes without it! Customers just love their laundry smells after washing with Glamor Wash. Tyler’s 2 most popular scents, Diva and High Maintenance have created a cult-like following for people who can’t get enough of these fragrances. Besides the jar candles that fragrance a room in minutes, the most obvious complimentary product for the glam wash is the Dryer Sachets. Once you clean your laundry in the Glamorous wash, you can dry them with the same fragrance! What are the Tyler glamorous wash ingredients? While the ingredient list isn’t listed on the product, its phosphate free and safe for all fabric materials. After being on the market for 10 plus years, its hard to find negative reviews that say the wash doesn’t clean well. 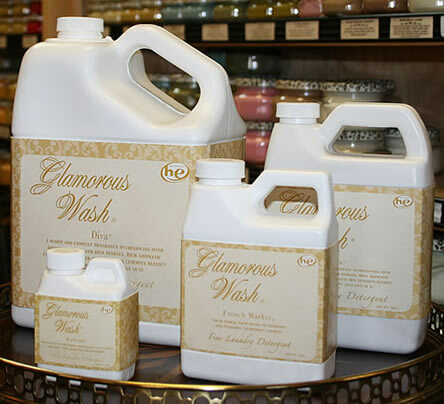 In our opinion, Tyler’s Glamorous Wash has the perfect ingredients to clean and make your laundry smell great. To some, Tyler’s line of fragrances are the ultimate fragrance scents. Where to buy Tyler Laundry detergent? Our online shopping cart sales all sizes and scents of Tyler Wash. We offer free shipping when ordering over $50 worth of products. Our prices are set at the lowest prices suggested by Tyler Candle Company. What Tyler fragrances are used in Glamorous Wash? Diva, High Maintenance, French Market, Tyler, Icon, Kathina, Fleur de Lis. How many different sizes does the laundry wash come in? There are 4 sizes: the gallon size, which is 128 oz, a large size, which is 32 oz, a medium, which is 16 oz, and a small size, which is 4 oz. What are the best tips you can provide about Tyler’s Fine Laundry Detergent? From a price point of view, you can save about $22 when you buy a gallon size, instead of 4 large bottles. You also should shake the bottle before each use to make sure no fragrance settles on the bottom. Are there any gift sets that have Glamorous wash? Yes, the Glamorous Gift Suite contains a small wash, small candle, and room spray. What do the Tyler Candle Glamorous Wash reviews say about the product? A large majority of customers become repeat buyers of the product. They just love the fragrance and freshness of their laundry after using the wash. You can control the fragrance intensity by using more or less of the product when washing a load of laundry. The scent will last a long time. What type of clothes or laundry can you wash with Tyler’s Glam wash? Basically this detergent is save for any type of linens, laundry, or clothes, from your everyday clothes to your special bedding or lingerie. During the 10 years of selling this laundry wash, we have heard of no complaints. How long does the scent last on the clothes? The answer depends on the cloth type and how much of the wash was used during washing. Some people have said it can last a week or longer, while others have mentioned they can smell the fragrance in their bedroom, after washing their bed sheets. Many people have noticed that out in public, people will comment on how well they smell. Why do some people think the Diva scent is not the same as it was before? Most likely, this is due to not shaking the bottle before its use. Settling can occur, where the fragrance can settle to the bottom of the bottle. To make sure the 1st use is identical to the last use, be sure to mix or shake the bottle on every use. Either way, Tyler does not change the fragrance formulations in any of their scents. Does Tyler Candle Company sale products directly to the public? Tyler distributes its products through local retailers who resale their products. It is mandated by Tyler Candles, that Tyler set all retailer prices. Cowgirls and Lace sells at the prices set by Tyler Candles and offers free shipping. We get our products directly from the Tyler Candle Company in Tyler, Texas. Is Tyler Glamorous Wash safe for Hi Efficiency (HE) washers? Yes, the detergent is formulated to be safe when used by HE washers, frontend washers, or top loading washers. It washes and cleans well in all washing machines. How much do you charge for shipping Tyler Glamorous Wash? Cowgirls and Lace offers free shipping on orders over $50. If your order does not qualify for free shipping, you can choose between priority or UPS shipping. In most cases, your order will be shipped out same day or the next. What Tyler fragrances are purchased the most? Which are most popular? Diva and High Maintenance are the easily the most popular scents that Tyler offers. Those 2 fragrances account for over 85% of all Tyler sales.